USU engineering faculty Marc Maguire led the development of a free online tool that estimates snow load requirements for new homes and buildings. Two Utah State University professors working with the Structural Engineers Association of Utah have created a state-of-the-art spatial mapping technology that estimates snow load requirements for new construction of homes and buildings. The Utah Ground Snow Load Map was created by USU assistant professor Marc Maguire and co-investigator Yan Sun. Marc Maguire, an assistant professor in the Department of Civil and Environmental Engineering, said he and his co-investigator Yan Sun, from the Department of Math and Statistics, spent two years creating the technology. An engineer then takes that ground snow load and transforms it into a roof snow load, and then applies some safety factors. Maguire said it is a free, online tool at a user-friendly web site: utahsnowload.usu.edu. The project was partially funded by industry sponsors. The site is now up and running and the team is working to educate users and stakeholders about the new tool. 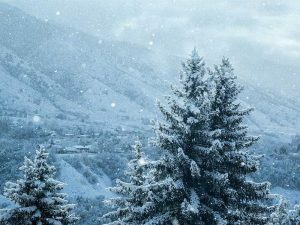 Maguire says Utah’s snow load predictions, which are codified in state law, were last updated in 1992 and in some cases were difficult to use.